Recent forecasts for the Phoenix, Arizona real estate market suggest that home prices could continue rising through 2019. The local housing market does appear to be cooling a bit, though, with smaller price gains expected this year. The city recently made a top-ten list of best markets for buyers. Given the current supply and demand situation within the Phoenix real estate market, it would not be surprising to see home prices rise somewhere between 3% and 5% during 2019. So let’s explore some of those supply and demand factors that are currently influencing this housing market. 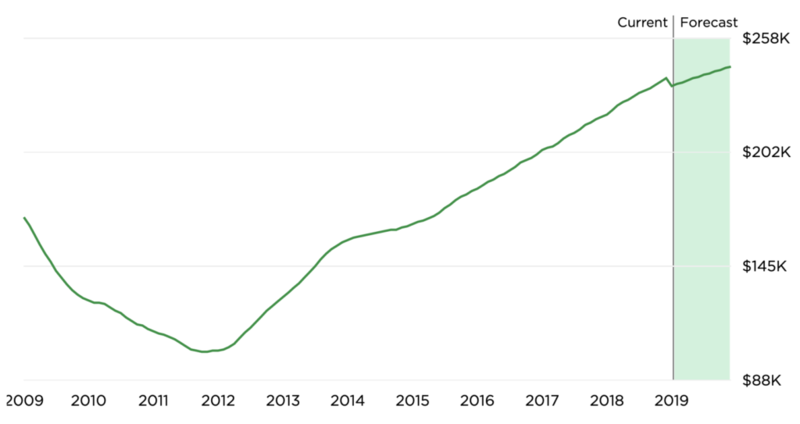 The chart below, provided by Zillow, shows the median home value in Phoenix, Arizona over the past ten years or so. The sharp drop you see from 2009 through 2012 occurred in the wake of the last housing collapse. Arizona was hit particularly hard by that crisis, and Phoenix was its epicenter. You’ll also notice a steady upward trend in the years that followed, along with a forecast for additional price growth through 2019. Phoenix home prices. Source: Zillow. Back in the spring of 2018, the Phoenix housing market was down to about a 2-month supply of homes for sale. That’s a theoretical metric used to track supply levels over time. In this case, it means that it would’ve taken two months to sell all homes listed for sale if no new ones came onto the market in the meantime. According to economists, a “balanced” real estate market has about a 5- to 6-month supply of homes for sale. Inventory conditions have improved over the last few months. Toward the end of last year, for example, the Phoenix real estate market had about a 3.5-month supply of homes. This means that home buyers who enter the market in 2019 could have more properties to choose from, compared to those who purchased homes last year or the year before. Phoenix is one of many real estate markets across the country where supply is still falling short of demand. But this appears to be changing, as new properties come onto the market. In 2019, growing inventory could be an important factor for the Phoenix real estate market. If inventory levels continue to rise, it would create a better balance between supply and demand. This in turn could lead to smaller home-price gains than those we saw in the past. The Phoenix area’s population has grown steadily since 2010, and this increases housing demand on both the rental and purchase side. The city of Phoenix had a population of around 1.6 million in 2017, when it was last measured. That was up from 1.4 million in 2010. The broader metro area now has a population of around 4.7 million people, making it the 11th largest metropolitan area in the country (by population). One reason for this population growth is Phoenix’s steadily improving job market. According to the Bureau of Labor Statistics, the unemployment rate for the Phoenix-Mesa-Scottsdale metropolitan area was down to 3.9% at the end of 2018. That’s a huge improvement, when you consider that it peaked above 10% in 2009, following the recession. Phoenix has long been a hotspot for retirees. Today, its job market and stable economy are also attracting younger residents from elsewhere in the country. This increases demand for housing and puts upward pressure on home prices. These and other factors have led to mostly favorable forecasts for the Phoenix housing market in 2019. The general consensus among economists and analysts is that prices in the area will continue to rise over the coming year, but probably at a slower pace than last year. Sales activity could cool this year as well, especially if the inventory situation continues to improve. Is Now a Good Time to Buy In Phoenix? Is 2019 a good time to buy a home in Phoenix? This is a hard question to answer across the board, because there are so many personal factors involved. But from a market standpoint, 2019 could be a great time to buy in the Phoenix area. Mortgage rates are still hovering at historical lows. As of mid-January 2019, the average rate for a 30 year fixed mortgage was 4.45%. That’s a great opportunity for home buyers. But rates are expected to rise later this year. More inventory has come onto the market over the past year, giving buyers more properties to choose from. This is good news for those who plan to enter the market sometime during 2019. Loan limits have have been increased for the entire Phoenix metro area. Federal housing officials increased the limits for conventional, VA and FHA loans. This means borrowers have a higher level of financing to work with, without having to cross into “jumbo” mortgage territory. The U.S. economy is stable with record low unemployment levels. Similarly, the job market in Phoenix has improved over the years. This gives buyers both the income and the confidence they need to make a purchase. Disclaimer: This article contains housing market forecasts and predictions for the Phoenix, Arizona area. Such forecasts are the equivalent of an educated guess and should not be viewed as financial advice or guidance.